Saturn is well known for being a gas giant, and for its impressive ring system. But would it surprise you to know that this planet also has the second-most moons in the Solar System, second only to Jupiter? Yes, Saturn has at least 150 moons and moonlets in total, though only 53 of them have been given official names. Prior to the invention of telescopic photography, eight of Saturn's moons were observed using simple telescopes. The first to be discovered was Titan, Saturn's largest moon, which was observed by Christiaan Huygens in 1655 using a telescope of his own design. Between 1671 and 1684, Giovanni Domenico Cassini discovered the moons of Tethys, Dione, Rhea and Iapetus – which he collectively named the "Sider Lodoicea" (Latin for "Louisian Stars", after King Louis XIV of France). In 1789, William Herschel discovered Mimas and Enceladus, while father-and-son astronomers W.C Bond and G.P. Bond discovered Hyperion in 1848 – which was independently discovered by William Lassell that same year. By the end of the 19th century, the invention of long-exposure photographic plates allowed for the discovery of more moons – the first of which Phoebe, observed in 1899 by W.H. Pickering. This was followed by the Cassini-Huygens mission, which arrived at Saturn in the summer of 2004. Initially, Cassini discovered three small inner moons, including Methone and Pallene between Mimas and Enceladus, as well as the second Lagrangian moon of Dione – Polydeuces. In November of 2004, Cassini scientists announced that several more moons must be orbiting within Saturn's rings. From this data, multiple moonlets and the moons of Daphnis and Anthe have been confirmed. The study of Saturn's moons has also been aided by the introduction of digital charge-coupled devices, which replaced photographic plates by the end of the 20th century. Because of this, ground-based telescopes have begun to discovered several new irregular moons around Saturn. In 2000, three medium-sized telescopes found thirteen new moons with eccentric orbits that were of considerable distance from the planet. In 2005, astronomers using the Mauna Kea Observatory announced the discovery of twelve more small outer moons. In 2006, astronomers using Japan's Subaru Telescope at Mauna Kea reported the discovery of nine more irregular moons. In April of 2007, Tarqeq (S/2007 S 1) was announced, and in May of that same year, S/2007 S 2 and S/2007 S 3 were reported. The modern names of Saturn's moons were suggested by John Herschel (William Herschel's son) in 1847. In keeping with the nomenclature of the other planets, he proposed they be named after mythological figures associated with the Roman god of agriculture and harvest – Saturn, the equivalent of the Greek Cronus. In particular, the seven known satellites were named after Titans, Titanesses and Giants – the brothers and sisters of Cronus. 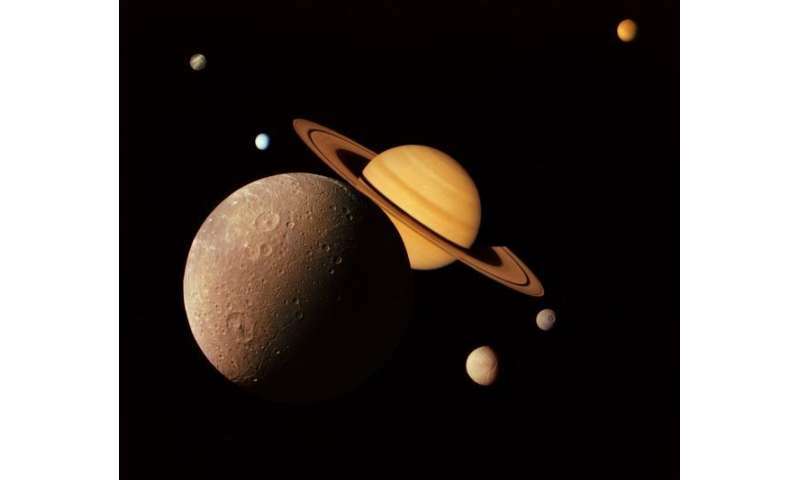 Saturn's moons are grouped based on their size, orbits, and proximity to Saturn. The innermost moons and regular moons all have small orbital inclinations and eccentricities and prograde orbits. Meanwhile, the irregular moons in the outermost regions have orbital radii of millions of kilometers, orbital periods lasting several years, and move in retrograde orbits. Saturn's Inner Large Moons, which orbit within the E Ring (see below), include the larger satellites Mimas, Enceladus, Tethys, and Dione. These moons are all composed primarily of water ice, and are believed to be differentiated into a rocky core and an icy mantle and crust. With a diameter of 396 km and a mass of 0.4×1020 kg, Mimas is the smallest and least massive of these moons. It is ovoid in shape and orbits Saturn at a distance of 185,539 km with an orbital period of 0.9 days. 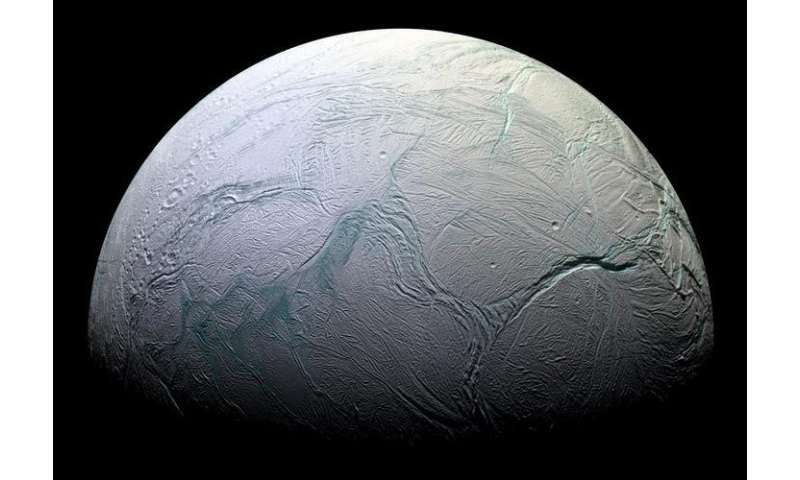 Enceladus, meanwhile, has a diameter of 504 km, a mass of 1.1×1020 km and is spherical in shape. It orbits Saturn at a distance of 237,948 km and takes 1.4 days to complete a single orbit. Though it is one of the smaller spherical moons, it is the only Cronian moon that is endogenously active – and one of the smallest known bodies in the Solar System that is geologically active. This results in features like the famous "tiger stripes" – a series of continuous, ridged, slightly curved and roughly parallel faults within the moon's southern polar latitudes. Large geysers have also been observed in the southern polar region that periodically release plumes of water ice, gas and dust which replenish Saturn's E ring. These jets are one of several indications that Enceladus has liquid water beneath it's icy crust, where geothermal processes release enough heat to maintain a warm water ocean closer to its core. With a geometrical albedo of more than 140%, Enceladus is one of the brightest known objects in the Solar System. At 1066 km in diameter, Tethys is the second-largest of Saturn's inner moons and the 16th-largest moon in the Solar System. The majority of its surface is made up of heavily cratered and hilly terrain and a smaller and smoother plains region. Its most prominent features are the large impact crater of Odysseus, which measures 400 km in diameter, and a vast canyon system named Ithaca Chasma – which is concentric with Odysseus and measures 100 km wide, 3 to 5 km deep and 2,000 km long. With a diameter and mass of 1,123 km and 11×1020 kg, Dione is the largest inner moon of Saturn. The majority of Dione's surface is heavily cratered old terrain, with craters that measure up to 250 km in diameter. However, the moon is also covered with an extensive network of troughs and lineaments which indicate that in the past it had global tectonic activity. The Large Outer Moons, which orbit outside of the Saturn's E Ring, are similar in composition to the Inner Moons – i.e. composed primarily of water ice and rock. Of these, Rhea is the second largest – measuring 1,527 km in diameter and 23×1020 kg in mass – and the ninth largest moon of the Solar System. With an orbital radius of 527,108 km, it is the fifth-most distant of the larger moons, and takes 4.5 days to complete an orbit. At 5150 km in diameter, and 1,350×1020 kg in mass, Titan is Saturn's largest moon and comprises more than 96% of the mass in orbit around the planet. 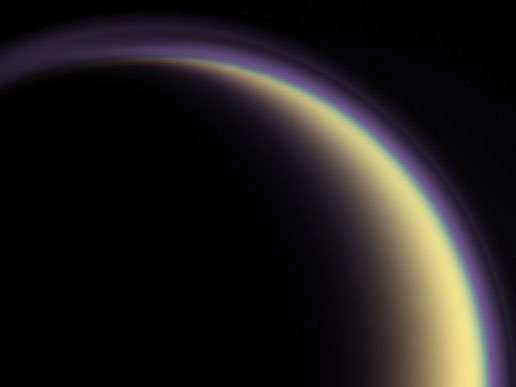 Titan is also the only large moon to have its own atmosphere, which is cold, dense, and composed primarily of nitrogen with a small fraction of methane. Scientists have also noted the presence of polycyclic aromatic hydrocarbons in the upper atmosphere, as well as methane ice crystals. The surface of Titan, which is difficult to observe due to persistent atmospheric haze, shows only a few impact craters, evidence of cryovolcanoes, and longitudinal dune fields that were apparently shaped by tidal winds. Titan is also the only body in the Solar System beside Earth with bodies of liquid on its surface, in the form of methane–ethane lakes in Titan's north and south polar regions. Hyperion is Titan's immediate neighbor. At an average diameter of about 270 km, it is smaller and lighter than Mimas. It is also irregularly shaped and quite odd in composition. Essentially, the moon is an ovoid, tan-colored body with an extremely porous surface (which resembles a sponge). The surface of Hyperion is covered with numerous impact craters, most of which are 2 to 10 km in diameter. It also has a highly unpredictable rotation, with no well-defined poles or equator. At 1,470 km in diameter and 18×1020 kg in mass, Iapetus is the third-largest of Saturn's large moons. And at a distance of 3,560,820 km from Saturn, it is the most distant of the large moons, and takes 79 days to complete a single orbit. Due to its unusual color and composition – its leading hemisphere is dark and black whereas its trailing hemisphere is much brighter – it is often called the "yin and yang" of Saturn's moons. 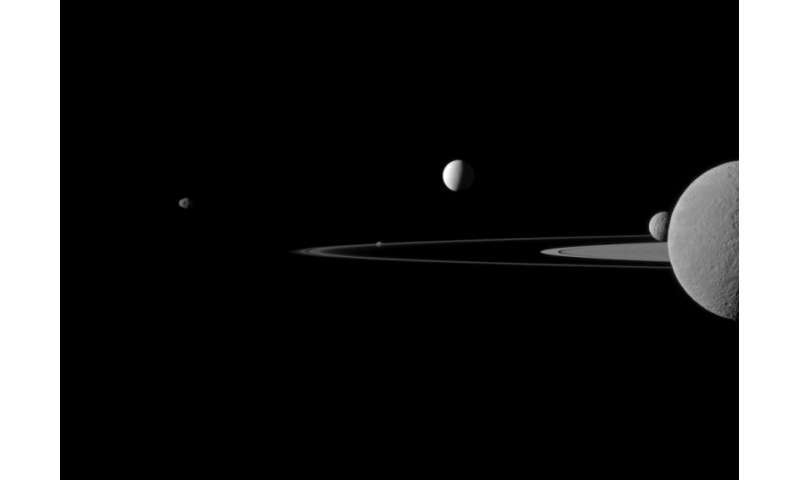 Beyond these larger moons are Saturn's Irregular Moons. These satellites are small, have large-radii, are inclined, have mostly retrograde orbits, and are believed to have been acquired by Saturn's gravity. These moons are made up of three basic groups – the Inuit Group, the Gallic Group, and the Norse Group. It is thought that Saturn's moon of Titan, its mid-sized moons and rings developed in a way that is closer to the Galilean moons of Jupiter. In short, this would mean that the regular moons formed from a circumplanetary disc, a ring of accreting gas and solid debris similar to a protoplanetary disc. Meanwhile, the outer, irregular moons are believed to have been objects that were captured by Saturn's gravity and remained in distant orbits. However, the mechanics of how the moon's formed remains a mystery for the time being. With additional missions mounted to study the atmospheres, compositions and surfaces of these moons, we may begin to understand where they truly came from. Much like Jupiter, and all the other gas giants, Saturn's system of satellites is extensive as it is impressive. In addition to the larger moons that are believed to have formed from a massive debris field that once orbited it, it also has countless smaller satellites that were captured by its gravitational field over the course of billions of years. One can only imagine how many more remain to be found orbiting the ringed giant.